Properties in New Post average 4.7 out of 5 stars. Property 2: Private Cabin with Sand Beach on the Chippewa Flowage - Great Fishing! Property 3: Skillys Big Chip Lodge. Prime waterfront. Relax, fish, quality time, enjoy! Property 6: Quite, Secluded Vacation Spot. Property 10: Super Private...Amazing Views...Quiet Solitude!! 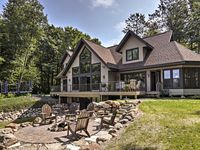 Property 22: Lakefront Hayward Home w/ Fire Pit by Ski Trails! 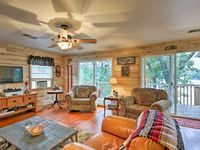 Property 23: Cozy, private, woodsy retreat; clear water, sandy bottom, close to bike trails! Property 27: Spacious Northwoods Home - Perfect for Families - Great Fishing!! Property 33: SPECIAL! Winter /Early Spring :Snowshoe, snowmobile, ice fish, snuggle by fire! Property 36: Look no further - Sunset Retreat is your vacation spot! Property 39: Quiet Cottage w/Artist Loft, Sauna, on a peaceful, great for kayaking lake! Property 42: Your LUXURY Get-Away! Charming Private Lake Home On the Beautiful Tiger Cat !! Book for summer fun! Property 43: Charming Private Lake Home On the Beautiful Tiger Cat !! Book for summer fun! Property 46: Waterfront Hayward Cabin w/ Pontoon Boat Rental! *On The Lake & In The Woods! Great Winter Getaway @ $222/nite + $100 add nites! Property 48: *On The Lake & In The Woods! Great Winter Getaway @ $222/nite + $100 add nites! Amazing beautiful property! Exceeded expectations! Absolutely loved our time! Very welcoming with snacks etc. All of our expectations were exceeded, House seemed bigger than anticipated! We had a lovely week at this property - fishing, taking the canoe out, painting the scenery, and grilling out. The view from the deck and the front window is absolutely amazing; we couldn't get enough of it! Our toddler enjoyed playing on the deck which was very safe. The grill looked to be brand new and we had a great time making steaks and pork chops. The house itself was clean and cozy. The stove must've been repaired since previous reviews - not a great stove but we cooked several meals on it and baked cookies. Great amount of bakeware &amp; cookware, more than other VRBOs. The playground is a walk down the hill from the property...we ended up biking to it as it was too far for our toddler. It's an old playground but she had a blast anyway. There is a cabin directly to the left and another deck/side of the house owned by someone else, but we didn't see a single soul the whole week. It was blissfully quiet. The only downside is the bathroom which is dated (particularly the very old shower/tub). But we were still very satisfied with our choice--nothing beats that view. Note to future renters: There's no laundry so bring extra clothes as the weather changed on us quite a bit. You'll also need to bring your own toilet paper (only one provided), bath soap (there's hand soap), and coffee (there's a coffee pot with filters but no coffee grounds). Be sure to stop in town for puzzles at Michelle's Crafts, art supplies at Art Beat, the hilariously awesome Freshwater Fishing Hall of Fame, and the fish &amp; chips at Angler's.